The weekend was a gem. And I watched a ton of Jem. Got up to all sorts of adventures and like many of you, it probably had a bit to do with St. Patrick’s Day. However, I did not get up to the green beer festivities. Pol Plastino‘s lady Elea celebrated her birthday on Saturday night. I was feeling like making cocktails because I see Simon, Josh and Katie make them all the time at Veneto and it seems fun. Pol said Elea’s favourite cocktail from the bar was the Jenkins. 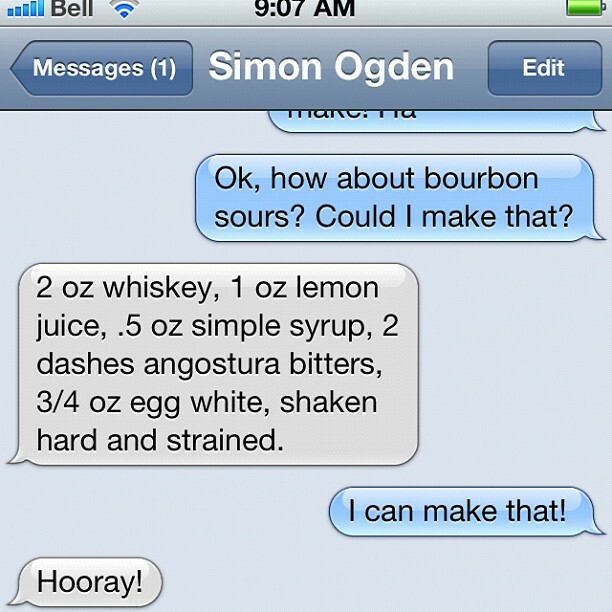 That one is too hard for me to make, but her next fave is the Bourbon Sour. You’ll see the instructions above. I brought a bottle of Baker’s bourbon… a giant bag of lemons, simple syrup (just dissolve equal parts sugar and water), bitters, egg whites (bought the carton from the grocery store, $3-ish)… a shaker, strainer, and juicer thing… and away we went. I love the ice globes they serve at the fancy cocktail lounges and really REALLY wanted them to drop in the red solo cups (you know, to class it up). 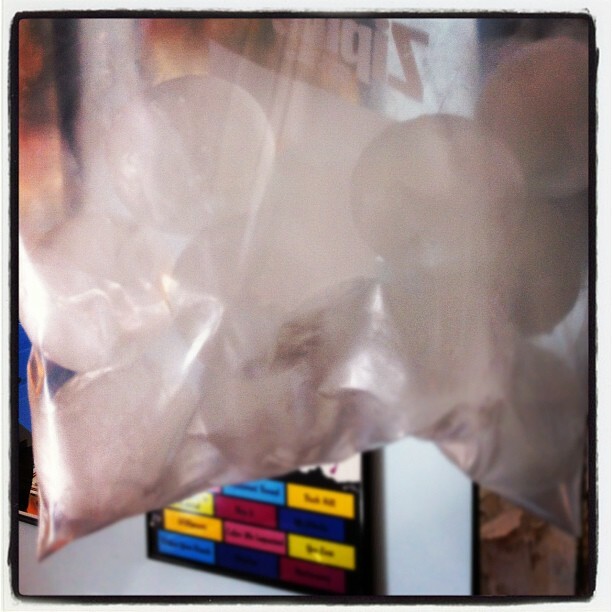 Shawn from Clives Classic Lounge gave me a bag full of ice globes! I will say, after jamming out cocktails for folk’s at the party… its a lot of work. And I was only making Bourbon sours, or Bourbon Old Fashions… if I had to know anymore than two, my brain would have exploded. AND I had Jess helping me. Good times and great people at Elea’s birthday! Sunday was sunny… Coral was in a Sunday movie mode, so Mads and I hit the town. And I’ve got her into fish and chips. Its turning into a weekend thing to head downtown, and lately our place to go is Red Fish, Blue Fish right on the water. 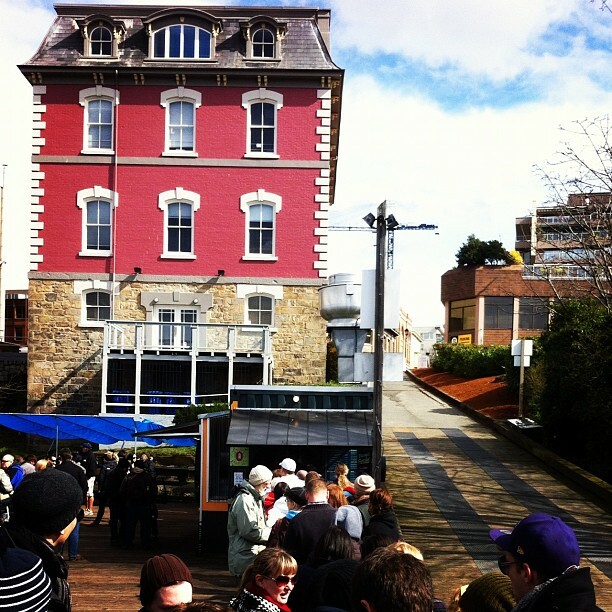 With the weather cooperating, the line for a fish taco stretched along the wood planks of the wharf. But it was pleasant and Mads was in a good mood, so we waited and chowed down on Cod Fish and chips (with three dips! That is important for Madelyn, so we had ketchup, their tartar sauce and then the Malt vinegar syrup) . And I had the scallop taco and the Pacific Fish taco. Mmmmm. I’ll NEED to try the chowder sometime and the poutine. 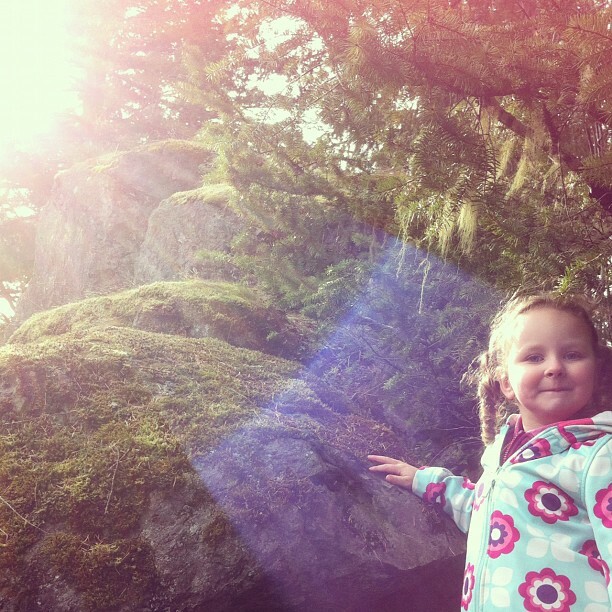 After fish, and dropping some deep-fried pickles off to Mom… Mads and I hit the trails. My brother had taken me to Roche Cove before… and I remember us thinking it would be a good place for a little one. So I went back on Sunday with Madelyn. I like Roche Cove because you get a lot going on with a fairly easy walk. Ocean, rivers, lakes, rain forest, easy trails/or/muddy trails. I also like the drive out to East Sooke. Drinking with friends, eating fish tacos and hiking with Maddy was the best weekend EVAR.